Pat Buchanan is my favorite political commentator. I get a lot of flak for this. I don’t agree with a lot of what he says, but he has a solid perspective based an a mountain of knowledge. He often comes across as bigoted, which can be puzzling, since it seems to be mostly counter to the way he sees current reality. He is a paleoconservative and nationalist in the extreme. What is often mistaken for racism is a strong conviction that if you are living in America, you should be an American first, including subscribing to what he sees as the socially conservative heritage and giving up other affiliations. Reality occasionally clashes with his faith-based convictions making it seem as if the man has two worldviews, each of which he argues with extreme conviction, but which are mutually exclusive. Maybe I’m just used to this because my dad seems to think the same way. 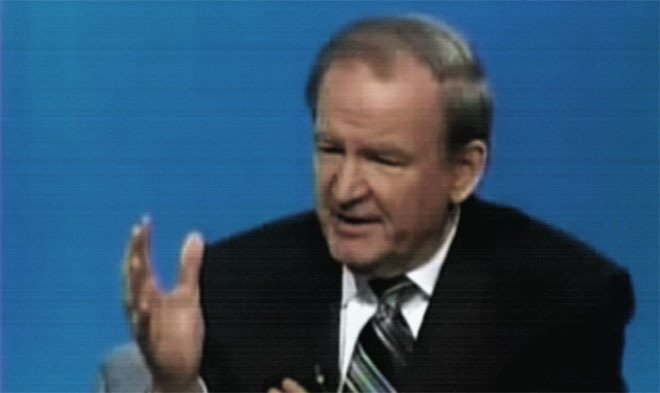 Pat Buchanan is one of the core members of the McLaughlin Group, where every Friday he can be seen trying desperately to get a word in edgewise while enunciating all of his points with his signature chop (pictured). In the past he has been mostly in contention with Eleanor Clift, but recently the two seem to agree with each other more than they agree with the more centrist members of the group (I can identify with this). In a recent episode he coined the term Toyota Republicans to refer to the demographic of mostly southern workers at foreign car plants here in the U.S.
Pat Buchanan is a very sharp 70 years young, and has a resume including a masters in Journalism from Columbia University, opposition speech writer and advisor to Nixon, white house communications advisor (85-87), and three time presidential candidate. What impresses me most about him is that while he has a strong desire to turn the country towards Christianity, which he sees as its roots, he has an iron grip on the current reality and is able to predict how a complex political or social issue will play out with as great an accuracy if it is going against his goals as if it is moving towards them. And he strikes me as very honest, which is a sorely underrated trait in today’s politically correct and cautious commentary. Political correctness veers us towards a time in which there is only one opinion the press is allowed to have, which is hardly the intent of the First Amendment. Pat Buchanan has biased opinions, but near impartial predictions. The Great Betrayal: How American Sovereignty and Social Justice Are Being Sacrificed to..